Front Outer Tie Rod Ends/Anti-Bumpsteer Kit. Pillow ball Teflon Lined Ends (Pair). Extra threads of adjustment will help you dial in toe settings to your desired specs. Also by using the supplied spacers to return the tie rod back to its proper angle, you will eliminate this wheel jerking effect. 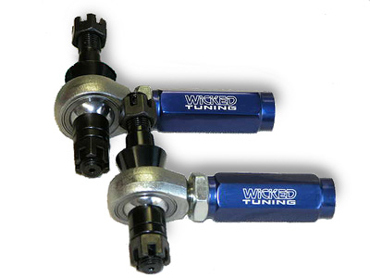 Wicked bump steer kits are made with A6061 forged aluminum with an anodized coating. The Teflon-lined pillowball reduces deflection improving steering response. Front and rear kits are in stock for S2000 of all years. Recommendation: For cars lowered up to 2" start with the large spacer.